When it comes to Philly’s most famous sandwich, the cheesesteak is easily the most famous -- let’s call it the Matt Dillon of sandwiches -- it's well known, usually gives a pretty solid, maybe not unremarkable, performance, but a good choice for your leading lunch. The roast pork, however, is more like the Kevin Dillon (i.e. Johnny Drama) of the family. It’s criminally underrated and easily more enjoyable than its brother, even if it's a little bit weird looking. To give the roast pork sandwich its due, we’ve pulled together a list of the the top seven sandwiches the city has to offer. 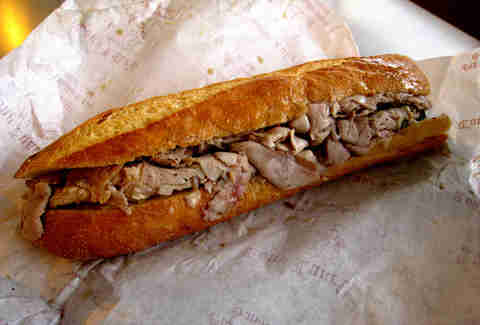 Along with DiNic’s, John’s is probably the most well known of the sandwich shops serving roast pork (hence the name). 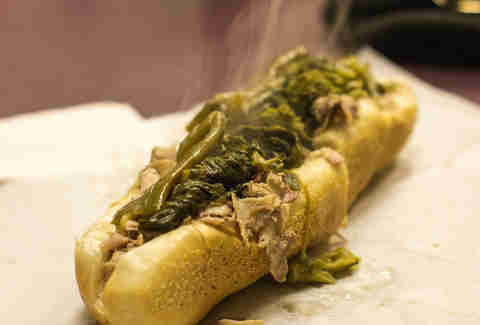 Located in South Philly, John’s has won a ton of local and national awards and rightfully so, it makes a mean sandwich. Previously, John’s was only a lunchtime destination, closing down every day by 4pm. In March, John’s announced that it extended hours until 7pm, meaning you no longer have to eat dinner on senior-citizen time. This small shop is nestled in the heart of the Italian Market and is unabashedly South Philly -- let’s just say the interior is something only a mother would love. 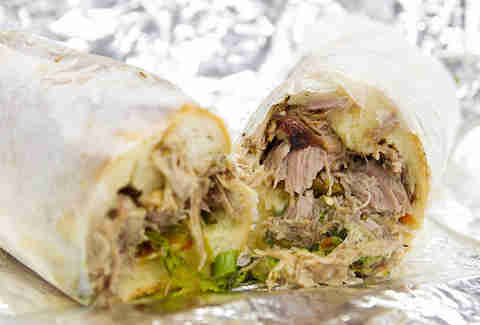 But this is about the food and George's makes a great roast pork, albeit with two small complaints. The bread is a little soft (and get’s soggy quicker than a bowl of cornflakes), and it charges extra for what should be standard toppings: provolone and broccoli rabe. Still, it’s a great spot to show your out-of-town friends a real Philly experience after a morning walking through the market. Paesano’s represents new-school Philly -- fun, adventurous, and ready to win a Super Bowl (as long as we don't have to throw the ball, ever). With two locations around the city, our favorite is still the one down the street from George’s in the Italian Market. 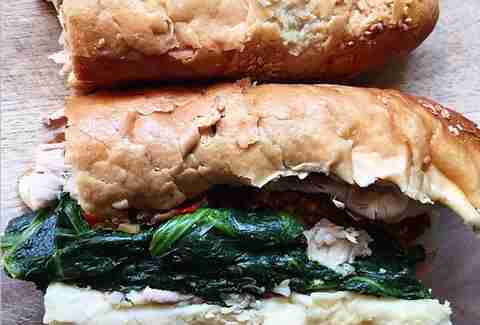 While Paeasano’s has a ton of great sandwich options, we recommend going with its Arista (i.e. roast pork). It’s made with suckling pig roast pork and comes standard with long hots. 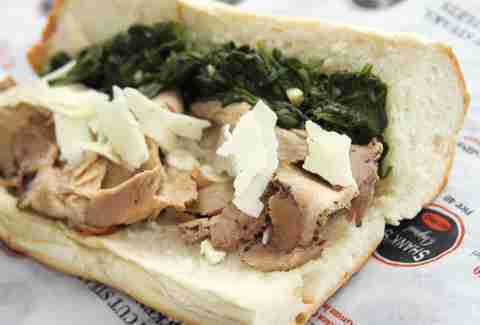 In terms of the city’s best roast pork sandwiches, DiNic’s needs no introduction. It’s a tourist mecca and has been on pretty much any TV show that has filmed in Reading Terminal Market. A mid-week trip to DiNic’s is a simple five-step process: 1) wait in the longest line in Reading Terminal, 2) struggle to find seating to consume sandwich before it get’s too soggy, 3) suffer from severe, meat-induced food coma, 4) regret decision, 5) spend the rest of the afternoon watching YouTube videos instead of answering emails. If you’re looking for a date-worthy place (or if the parents are footing the bill), the roast pork at Old City’s High Street on Market is the perfect option. Available at lunch time only, it’s an upscale take on the Philly classic with fermented broccoli rabe, sharp provolone, on a house-baked seed semolina. 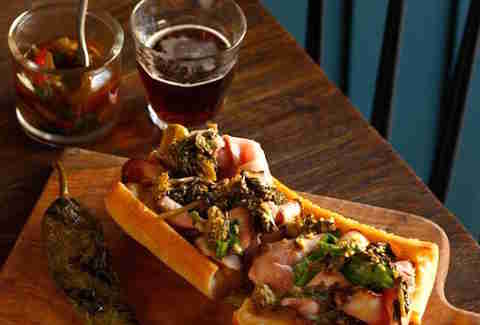 Usually we’d be against eating a hoagie at a fancier, sit-down restaurant, but at High Street go for it, you will not be disappointed. While Philly cheesesteak ambassador Tony Luke’s is known for Philly’s most famous export outside of the Italian Stallion, it also makes a pretty solid roast pork sandwich. The pork is slow-roasted in house and the bread is made fresh every hour (if it’s been sitting too long, it gets tossed out). We recommend the original South Philly location, even though Tony Luke’s sprawling empire means that you can get your pork fix in as far away as Bahrain. Shank’s, that little place that you drive by on the way to Target that looks like a rest stop, is a sleeper option for one of the better pork sandwiches in the city. 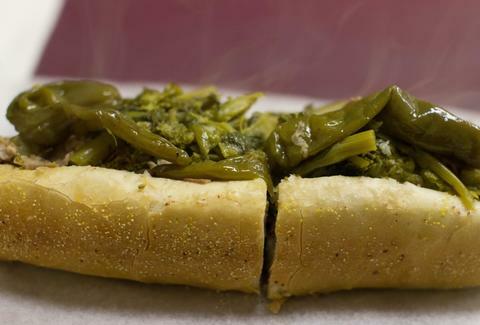 A South Philly original, Shank's relocated to that lonely strip of Columbus Blvd in 2009, and brought with it the sandwiches that have made it a city favorite since 1962. 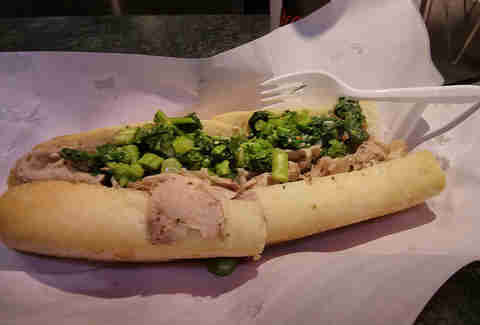 Its Roast Pork Italiano has the right ratio of ingredients, served on a seeded roll that's worth the extra 50 cents.